Two o'clock in the morning, a Thursday morning, the first bit of water broke through the ground of George Clatterbuck's back pasture in Habit, Kentucky, and not a living soul saw it. "Life there is not unpleasant, and for most, it is temporary. Not so for Rose, a beautiful, mysterious woman who comes to the home pregnant but not unwed. She plans to give up her baby because she knows she cannot be the mother it needs. But St. Elizabeth's is near a healing spring, and when Rose's time draws near, she cannot go through with her plans, not all of them. And she cannot remain forever untouched by what she has left behind ... and who she has become in the leaving." This novel begins with a retracing of the history of the land where St. Elizabeth's now is, of the forming of a magical spring. It goes on to tell Rose's story, and I was immediately drawn in by the book's premise and style. I couldn't put it down, even though I was trying to spread it out. The first section has a magical feel, what with the spring miraculously curing animals and people of their ailments, but after that it becomes strictly realistic. This was a bit inconsistent, but it didn't bother me; I was too engrossed by this atmospheric novel. The setting and the characters were amazingly evoked by Patchett's writing, and while the book certainly isn't overwritten, there's plenty of description. I was immediately hooked by the first few pages, which were very historical, and the rest of the novel was great as well. Rose was a fascinating character, and I loved her narration; she was obviously a sympathetic character, but not entirely so. As one might expect, she lies a lot, about things great and small, and these lies are woven throughout the novel. This was such a great story; I'm not sure how insightful it was, but I was entertained and at times moved. The characterization in this novel is astounding; although I didn't initially like it, Patchett makes use of different narrations to great effect. Rose begins the novel, followed by Son, followed by her daughter Cecilia, and through their eyes, all of the characters in the story are developed. One feels sympathy for each narrator. Towards the end, Rose becomes harder and harder to fathom, so it was quite good to have seen her perspective earlier. 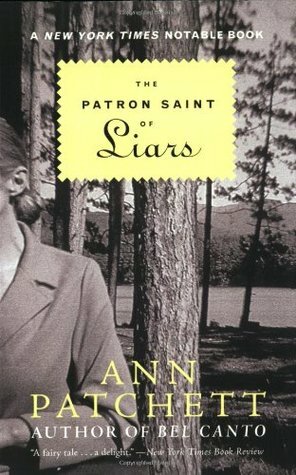 The Patron Saint of Liars was certainly different from what I was expecting; the plot summary is quite awful in terms of actually summing up the book, which takes place over many years, but almost entirely at St. Elizabeth's. I was never sure where this book was going, and that I enjoyed. I did find the ending quite abrupt though; I craved more of a resolution. However, the writing, the description, and the characters were all marvelous. Since I had read Patchett's essays, I picked up on a few personal touches, such as Patchett's love of driving and the freedom it brings her. I disagree, due to the immense environmental cost and inefficiency, but driving was a central part of the book and is certainly a central part (unfortunately) of America. I would have raced through this book if not for being on a trip, but this is certainly my favorite Patchett novel, and my favorite of her works in general. I do need to reread Bel Canto, but I don't remember it being as compelling as this book. The Patron Saint of Liars doesn't read like a first novel at all. Definitely recommended.